Last year, our Website Optimisation Manager, Suze, gave some great conversion rate optimisation tips for maximising online sales at Christmas time. To follow on from her recommendations, I have provided a few more tips to ensure you ride the sleigh of success straight to the North Pole this holiday season. Your page titles and meta descriptions are essentially your organic ad copy and are often neglected. As the volume of searches ramps up towards Christmas, a fraction of an improvement on your click-through rate could mean additional sales or enquiries to help hit those vital targets. Ensure your listings stand out in the crowded SERPs with well written and thought out page titles and enticing meta descriptions. You can take this a step further by adding mark-up to your page content to add rich snippets such as product stock level, star ratings and price to your results. You can do this using schema.org or to some extent Google Search Console’s Data Highlighter. A link to a ‘page not found’ is a lost link. It can also mean a search engine drops your page from its index and offers visitors a poor user experience. Google Search Console kindly shares ‘page not found’ errors as it finds them. Work to get these cleared up before the Christmas rush. Spend some time checking how fast your most important pages load. How do they compare to the site average, are they slow? Do they load slowly on mobile devices? Is there anything you can do to speed them up? All of this information can be found by taking a look in Google Analytics to see how long it is actually taking your pages to load for site visitors. Use Google’s Page Insights tool to identify what you can do to speed up your pages. One of the most common issues that slows page load is having large images. Lossless compression of your images is also probably the easiest (if time consuming) thing to work on. Again Google’s Search Console can help you out here; it will point you in the direction of pages with mobile usability issues and provide some detail how to resolve the issue. Look at what happened last year. What pages performed well? Which ones didn’t? you can do to improve these pages, for example, can you help your users better navigate your site with improved signposting on these pages? Is the information the searcher is looking for immediately obvious? It doesn’t look good to Google if there is a large proportion of searches bouncing straight back to the SERPs from your pages. Finally optimise your images, give them friendly names, and set the alt attribute to something that describes the image. People use Google Image search to look for products so you need to make sure yours are there. As you can see, there are a couple of quick wins you can make to your website to ensure that you are maximising your online sales this Christmas. With only 41 days to go, don’t delay in making these changes. Good luck! In the Weekly Shop this week, we take a look at how British town centres have adapted as consumers move towards digital, some Facebook news, which includes a useful new ‘Save’ feature and how to breath life into old content. A new report has shown that British town centres are changing as they adapt to evolving customer demands. The report found that Britons are above all looking for convenience – and finding it both in high street, for quick ‘top-up’ shops, and online shopping, whereas once they found it in out-of-town retail destinations. The report suggests convenience is driving digital ways of buying and that click and collect has pushed people back to stores. More on the report over on Internet Retailing. After announcing their ‘Buy Now’ button trial last week, Facebook have also just announced that they are testing a new ‘Save’ feature. This feature will let you bookmark things you discover on Facebook, so you can read them at a more convenient time. This will no doubt be very useful for both brands and users as posts frequently get lost in the constantly refreshing news feed. Keeping on the topic of Facebook, this week we also learnt that Facebook has now 399 million mobile-only monthy active uses. This means that almost 1 out of 3 Facebook users never use the web version of Facebook, clearly showing a trend of users moving away from Facebook’s web platform. Definitely something to keep in mind when you are planning your marketing efforts on Facebook. One of the biggest changes within content marketing is constantly coming up with ideas for great content. Whilst fresh content is important, you should equally be thinking about repurposing the fantastic content you’ve already created. This article from Econsultancy explores how you can breathe new life into old content, so it performs a useful function within your user journey. Onto a new development in Paid Search. This week, Google announced that starting in late July, Product Listing Ads (PLA) will now feature product ratings. Currently this feature is only available in the U.S. but Google have stated that it will be introducing product ratings in additional countries throughout 2014. Definitely something to keep an eye on if you use reviews on your website. 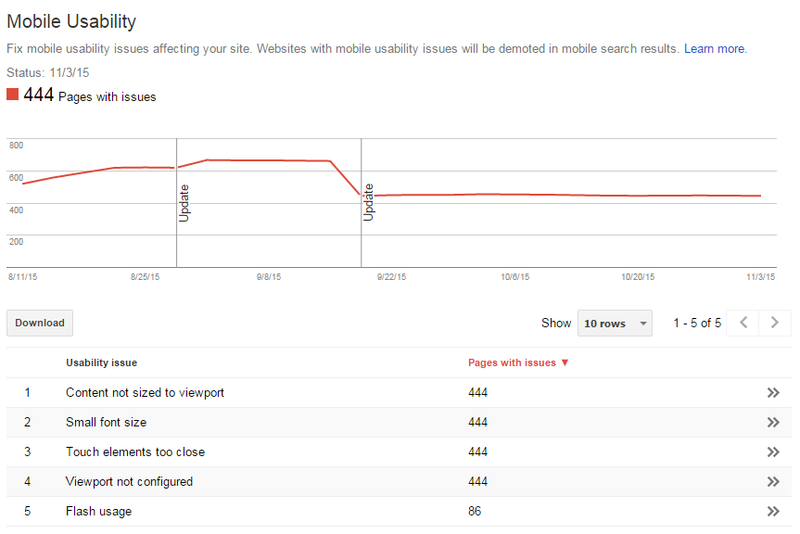 Another development from Google this week saw a version of Google Analytics released for iPhone. The iPhone app comes more than two years after Google released Google Analytics for Android and allows users to check in on their website analytics — including real-time visitor reports — from the comfort of their smartphone. In addition to real-time and time-based reports, the app can be used to view behaviors, conversions and more. In The Weekly Shop this week, we have a white paper around customer experiences at Christmas, some tips on how you can build loyalty during a long purchase cycle, how retailers can leverage unique identifiers and structured data and an article from the Froggblog around the recent updates to Google’s Analytics and Webmaster tools. First up is a white paper from eDigitalResearch which examines how consumers rate their current contact with brands during the festive period and what they feel should be done to better their experiences at Christmas as a whole. The white paper yielded some interesting findings and is well worth a read. A key element for a majority of loyalty programs is product purchase frequency which enables members to earn more reward currency and keep the products and program on the forefront top of mind. But what happens when you have products without this high rate of purchase frequency? This article from Econsultancy looks at how implement a successful loyalty program with a little creative thinking and a different approach. This article from Search Engine Land looks at how what we have learned to date about entity search, semantic search and the semantic web and how it can be applied to ecommerce. The article contains some useful tips on how online retailers can leverage unique identifiers and structured data for ecommerce. Our last article is from our Senior Natural Search Consultant, Ben. There has been a plethora of updates in recent weeks and months to Google’s Analytics and Webmaster Tools and in his article Ben takes a closer look at the three key recent updates not to be missed if you want to maximise your online marketing campaigns. More over on the Froggblog. There has been a plethora of updates in recent weeks and months to Google’s Analytics (GA) and Webmaster Tools. The three key recent updates not to be missed if you want to maximise your online marketing campaigns are detailed below, and best of all they are all free! 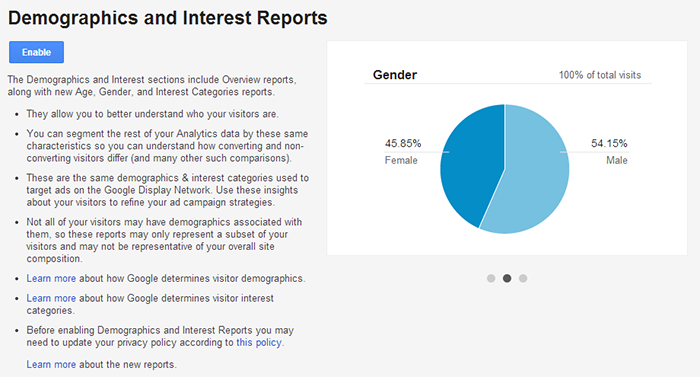 New to the ‘Audience’ section of Google Analytics are Demographics and Interest reports, detailing as you would expect, age, interests and gender. The reports offer valuable insight in to site users and customers, vital to planning any successful online marketing campaign. Age & Gender – As it says, you’ll be able to see a breakdown of the age range of visitors and their gender, all with detailed information on Acquisition, Behaviour and Conversion. Interests – Visitors are divided into three slightly confusing interest groups, ‘Affinity,’ ‘In-Market’ and ‘Other Categories.’ The purpose of these groupings is to allow ads to reach people interested in products and services. However, the categorisation of people based on their interests as they browse pages across the Google Display Network means Google Analytics can report the interest group of a site visitor. Brilliant! Within these three groupings are what we are really interested in; much more meaningful interests including News Junkies, Avid Readers, TV Lovers, Music Lovers, Home Decor Enthusiasts, Travel Buffs and Cooking Enthusiasts to name but a few. The information for these new reports comes from the DoubleClick third-party cookie. Since most people won’t be opting out, this will account for a good proportion of your visitors. To start seeing the data in GA you need to simply add a line of code to your analytics tracking snippet, set the enabling options in Analytics and wait for the data to come in. More detailed instructions from Google can be found here. How should I use the data? 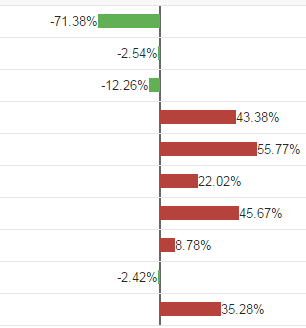 Probably the most powerful part of this is the ability to use the data in custom reports as the basis for segmentation. This means that you’ll be able to evaluate how your users’ behaviour varies by demographics and interests. For example, do females interested in travel convert more frequently than males who are interested in cooking? I like. You’ll be able to quickly form basic customer personas without having to even ask a question! Read more here. Google’s Universal Analytics has been around a while in Beta, but is now being rolled out and is soon set to be the operating standard for Google Analytics. Google describes Universal Analytics as “a set of technological innovations that improve the way data is collected and processed in ‘Google Analytics.’ Sounds good to me. What are the benefits of Universal Analytics? Get the new and more flexible data collection methods – A key benefit to Universal Analytics is the ability to collect data from any digital device, not just website visitors, this might include Apps and in-store consoles. Use simplified and more accessible configuration options – Previously things like cross domain tacking could cause a headache for developers. The new analytics will allow configuration without having to make changes to the tracking code itself. Collect data that’s unique to your business – Create custom dimensions and custom metrics to collect data that isn’t normally recorded in GA like product details, levels in games, or authors of content pages. Stay up to date – Universal Analytics is the new operating standard for Google Analytics, to receive any new updates you will need to have upgraded from the Classic Analytics to the Universal Analytics. Sounds good doesn’t it? Get started using Google’s Universal Analytics Upgrade Guide. Mistakes are a surprisingly common occurrence with smartphone sites and can completely undo the benefit of creating a mobile optimised site in the first place, Google recently announced how these ‘crawl errors’ can affect the ranking of your site on mobile devices. To help webmasters offer mobile users a far better experience, Webmaster Tools have recently introduced reports specifically for smartphones. One of the most common and frustrating experiences I have personally encountered is selecting a search result only to be automatically redirected to the homepage of the site rather than the product or category page, argh! The GWMT Faulty redirects will help you identify and rectify this. Great! Google take a lot of criticism from the industry but the valuable tools and information they provide help marketers improve their campaigns and deliver more compelling customer experiences. With all of Google’s tools constantly being worked on and improved it’s important to ensure that as a marketer, you keep up to date and utilise these tools to the fullest. The updates above have some serious potential so get out there and start using them! In the Weekly Shop this week we take a closer look at Google’s move towards a more semantic and user-centric approach to SEO. We also look at search data which has highlighted a fast change in the way we shop and some evidence that suggests that Google has started to enforce smartphone penalties. Plus, some more results from the study we featured last week which highlights what promotions shoppers are more likely to respond to. The last couple of Weekly Shops have been full of developments from Google and it can’t be denied that these changes are all part of their longer term strategy to move people away from tactical SEO behaviour and towards a more strategic approach. This article takes a few steps back and looks at the bigger picture of what impact these changes will have on SEO. Following on from the above, this article from Search Engine Watch explores how we can put the user-centric concept into practice across your SEO using searcher personas. To finish up on the SEO side of things, here’s another nice article from Search Engine Land looking at the psychology of Google to make sense of the rapid shifts in the SEO landscape that we’ve seen recently. Here are some nice visuals from content marketing evangelist Avinash Kaushik that our search team stumbled upon earlier in the week. The six venn diagrams in this article re-frame a unique facet of the digital opportunity/challenge, and shares how to optimally take advantage of the opportunity/challenge. There is some really good stuff in here laid out in a very digestible way. 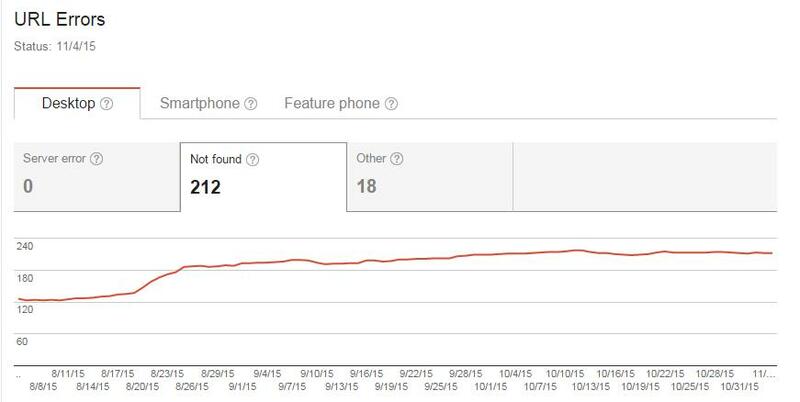 As if we needed any more convincing about the importance of mobile within your digital strategy, we’ve now seen the first evidence that Google has started adjusting search rankings appearing on smartphones based on how well the site in question handled the mobile user experience. More over on Search Marketing Land. And now for some retail news. This article from Internet Retailing look at figures from a study by Google and the British Retail Consortium which has shown that the way UK shoppers look for the items they want to buy is developing fast. In particular the report has shown strong growth for searches on tablets and smartphones and in search volumes from overseas customers looking for British retailers. Here are some more findings from the report from Retention Science that we featured last week. According to the study online shoppers are twice as likely to respond to free shipping offers than price discounts. We can completely back this up and have had the same results with a number of our clients – definitely something to bear in mind when preparing promotions for the festive season. That’s it for this week, happy reading! In the Weekly Shop this week we take further look at Google’s switch to encrypted search and some alternative methods to collect the missing (not provided) data. We also feature an article from Brand Republic which looks at the future of retail and follow up from the Digital Distress: What Keeps Marketers Up at Night? study we featured last week. The last couple of Weekly Shops have been full of Google news that has altered the way SEO professionals work, yet from a social media and content marketer point of view there is a thrill of opportunity for all digital marketing disciplines to work together as a cohesive team. This article on Search Engine Watch looks at what Google has changed and what those changes mean from a social marketers point of view. Great, All of My Keywords Are Gone…Now What? One of Google’s recent big changes was their move to encrypted search which resulted in the death of keyword data in Analytics. Many people have cited that this change will be the end of SEO yet it shouldn’t paralyse your SEO efforts if you are able to evolve and adapt your strategies as this article from Clickz explains. In light of the above, Econsultancy has rounded up some useful workarounds and alternatives for measuring organic keyword data. Even though nothing can really substitute for the real data that has been lost, the alternatives they’ve provided are quite useful – although we’re not too sure about the last example! Following on from the study we featured last week, which exposed marketers’ anxieties about their profession; Kendall Alan has expressed her opinion on why she thinks this might be over on Search Engine Land. She believes that thinking about customer experience is the key to easing marketer distress and it makes for an insightful read. To finish up, here’s an interesting article from Collective London that looks at how digital has changed the retail sector and what the future of retail is likely to look like. Many of the points in the article are aligned to how we think here at Leapfrogg and it’s well worth a read. If you’re a retailer running a paid search campaign on Google AdWords, ad extensions should be your best friend. If you’re not currently utilising them, this post will explain what they are and how they can benefit your business so you can start using them immediately. Ad extensions allow you to provide additional information in your Google adverts, making them more relevant and useful to prospects. In the context of increasingly competitive search engine result pages (SERPs), ad extensions can really make your ads stand out from the crowd, leading to significant increases in your click-through rates (CTRs) and better qualified traffic to your website, which in turn is likely to convert at a much better rate. All ad extension options can be found under the “Ad Extensions” tab (see below) which is located in the “Campaigns” window. Sitelinks allow you to promote specific pages of your site within your ad text. We have seen CTRs increase by as much as 20% with the introduction of sitelinks. Google allows you to have a maximum of 10 sitelinks per campaign however we have rarely seen more than 6 appear in a SERP. Because sitelinks are so quick and easy to update, they provide retailers with a great opportunity to inform prospective customers about special promotions and sales. Here is an example of a sitelink extension in action directing visitors to the ‘Winter Sale’ and ‘New Arrivals’ pages, for example. The upshot is that prospects have the opportunity to click directly through to the content most relevant to them. Backed by high quality landing pages this leads to reduced bounce rates, increased time spent on site and ultimately increased conversion rates. As you can only have one set of sitelinks per campaign, it is worth splitting up your campaigns into different products/categories. This will not only give you greater targeting and budget control over certain products, but will allow you to create relevant sitelinks for each product, thus leading to an increase in click-through rates. 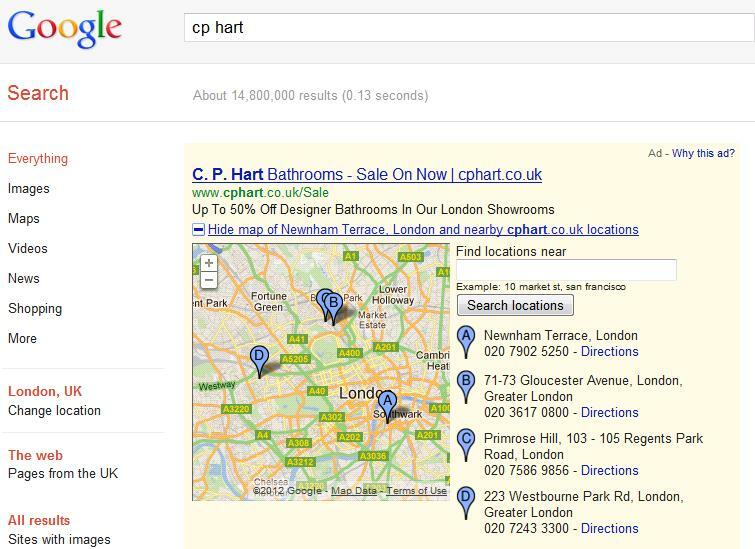 If you’re a multi-channel retailer with physical stores you should definitely be using location extensions. These help prospects and customers find the store nearest to them when they search for your products or services (based on their physical location or their search query). To set these up, you can either manually enter your business locations, or if you have a Google Places account, you can link this up to AdWords and addresses will automatically be uploaded. You can set location extensions at campaign-level or ad-level. Product extensions work with your Google Merchant Centre account to include additional product information within your ads, for example images and prices. These act as a great way to showcase your products and highlight price before someone has clicked on your ad. To set these up, all you need to do is link your Merchant Centre account to your AdWords account and apply the extension to the relevant campaign. If you don’t have a Merchant Centre account, set one up immediately. By submitting a regular data feed of product information to Google, you have the opportunity to feature in Google’s shopping results and increasingly, due to blended search, have product listings appearing at the very top of the main Google SERP. Call extensions allow you to include your business phone number in your text ads, making it easy for users to directly get in touch with your business. There are different call extensions you can choose, depending on the user’s device. If you enable a Google forwarding number, a unique phone number will be shown in your ads and you are charged on a per-call basis. The unique phone number means you’ll also get more detailed reporting on your calls. If you choose not to enable a Google forwarding number, your business phone number will not appear on desktop or laptop computers, however it will be shown on mobile devices and made clickable (see below for example). If a user clicks on this number, you’ll be charged at the same rate for a standard ad click. Seller ratings allow you to display your online business ratings and reviews in your ad. Users can quickly identify highly rated businesses helping them to make more informed purchase decisions. You are only charged if someone clicks on your ad, so you get more qualified traffic at no extra cost. You don’t need to change anything in your account to set these up – they will automatically appear if you have 4 or more stars and at least 30 unique reviews within Google Product Search. The reviews are aggregated by Google from a variety of sources across the web, including Reseller Ratings, Bizrate and ReviewCentre.com. Hopefully this has given you enough information to start using ad extensions in your campaigns. It shouldn’t take long for you to start seeing improvement in your campaigns’ CTR and conversion rates. Don’t settle for the bog standard text ads when Google provide options for you to be far more creative. Don’t get left behind – start using them now! This week saw the announcement of a long awaited feature in Google Analytics called multi-channel funnels. Only a few weeks ago a new version of Google Analytics was launched (you may already have access to this now), however this latest feature could potentially change the way we use the tool from now on. Multi channel funnels are in essence a sales attribution tool, allowing you to see the whole conversion path from your website visitors up to 30 days prior to the conversion. The path will show the interaction between all of your media channels, so you can see which traffic sources and keywords initiate, assist and complete conversions. Up until now, the ad or channel that was last clicked on will be assigned the conversion in Analytics. In reality though, there will have probably been a number of different channels and interactions which contributed to the conversion. Multi channel funnels will allow you to see the whole journey a user takes before committing to a purchase, therefore allowing you to look beyond the “last click”. A number of reports will be available within this feature, including top conversion paths, assisted conversions and time lag. I’ll briefly explain each of these below. This kind of insight can be extremely useful, as you may find that specific channels are a lot more profitable than you first thought i.e. if they have more assisted conversions than last click conversions. The example above shows that there is more than one interaction for 30% of total conversions, in which case you will want to delve into the other reports to find out what these other interactions are. We have been using DC Storm on a number of our clients for a while now which covers all of this functionality and more, however this latest announcement from Google is certainly a statement of intent understanding the need for brands to better understand the sales journey in an increasingly complex online and multi-channel environment, and attribute sales accordingly. No longer can you assume that your customers only interact with one channel during their decision making and purchase process. Therefore, being able to see the interactions between all of the channels has become an essential tool in attributing sales and measuring ROI.